“I wrote a poem. Would you like to illustrate it? We could turn it into a book.” And so the project began. Linda is a writer and poet. I am a watercolor artist. Neither of us had ever tried a project like this before. As with previous projects we’ve undertaken, neither of us even considered the possibility that two novices could not pull this off. Of course we could write and illustrate a book! Linda’s poem, “Ribbon Dance,” is about a little girl who spends a day in the desert noticing…really noticing…her world. As Linda says, “It’s a quiet reminder to be present in the world.” Having never illustrated anything but my own ideas before, translating Linda’s thoughts and words into paintings was my first hurdle. We needed to find a way for me to envision what Linda had seen in her mind when she wrote the poem. We started by breaking down the lines of the poem and sharing photos and images with each other. Then I plunged in with the paintings. We sent both paintings and images back and forth until we found common ground. We stumbled through issues like how paintings on facing pages would work together design and color wise. We learned we had to consider the orientation of the paintings—horizontal and vertical—as well as the size from page to page to ensure that we had continuity and flow. At some point my creative side took over and the paintings took on a life of their own separate from shared images or the words. The poem and my own mental images merged into something bigger than either of us could have done on our own. Painting can be lonely work. Most painters work by themselves, unless they are in a class or have a group they work with. 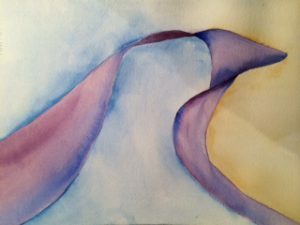 I was fortunate to be enrolled in a class at the time “Ribbon Dance” was being developed and I could take my paintings to the group for comments and suggestions. I consulted with others when I met challenges, such as where the shadows would be for a dancing child or how the proportions of a child’s figure would differ from an adult’s. Effective partnerships and collaborations produce more than individuals can do alone. Linda’s poem communicated easily on its own. My paintings could be framed individually or in groupings and stand on their own. Together our creativity flowed and we learned what we needed to learn to accomplish our goal. As Garmston and Wellman note in Adaptive Schools, “collaboration fuels group development.” The potential of individuals becomes a collective force and teams accomplish work they could not do in isolation. Get feedback. Accept what you know to be true and let the rest go. Painters, writers, poets, and musicians talk about our “work” with an awareness that when we are more playful with it, we are often more creative. Can we bridge the gap between work and play? An interesting question to ponder. Linda and I have collaborated on many projects almost all focused on teaching and learning…and maybe a few parties. When we tackled this collaborative art project, our partnership took on a more playful note that taught us some things about both work and leadership. I did not create the paintings in the same order as the poem. I painted whatever I felt moved to work on next. This made sense for me and was a much more playful approach for me. (The random arrival of paintings may have driven Linda crazy!) My painting evolved through the process and by the time I got to the last one, I circled back and did a couple of early ones over again so they fit better with how the later ones had emerged. Find work you like to do. When it feels fun, you’ll get more done, be more creative, and be happier in the process. Sounds simplistic but it’s profoundly important in organizations made up of people. Our work in schools depends on the energy and passion of the people involved. The project is done. The book is published. We both bought copies for ourselves, our moms, our children, and Linda’s grandchildren. My mother asked what we were going to do with the book…nothing more than that. We loved creating it together. We think our collaboration was a success. We think we bridged play and work with this project and that’s it’s own reward.